having spent many (but perhaps not quite enough) of the last few days dozing by the riverbank, we decided that today, being hot and muggy, would be a fine day to see the museums of munich. the glyptothek in koenigsplatz, recommended highly by no less august an individual than irene winter herself, was the first on the list. it is a small museum with walls of exposed whitewashed brick and a floor of large grey flagstones, with maybe 9 connected halls around a sunny, tree-ful central courtyard. i don't know if i've ever been in a museum as obsessed with material and with displaying statuary with such care and restraint. each pedestal is carefully and beautifully made--most out of a fine-grained pale-grey granite--with the dressing marks still on every face, but with the corners honed to a fine bevel. when the light comes in through the windows, the pedestals achieve the same soft tone as the marble of which many of the statues are made and seem to disappear. 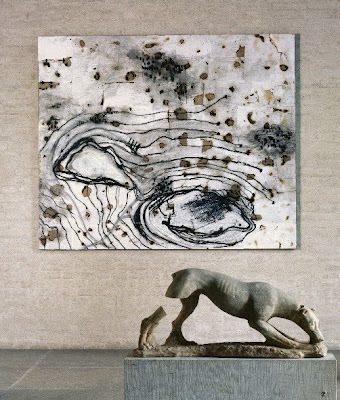 as in the case of the dog below (in front of a horst thuerheimer drawing) many of the fragmentary pieces appeared to be in the process of flying apart, held together only by the edges of their silhouettes. the pediment sculptures from the east and west facades of the aphaia temple at aegina were both installed a little above head level, on an unadorned blackened steel and granite base with two corner blocks of granite providing the suggestion of the shape of the pediment that would have been behind them. 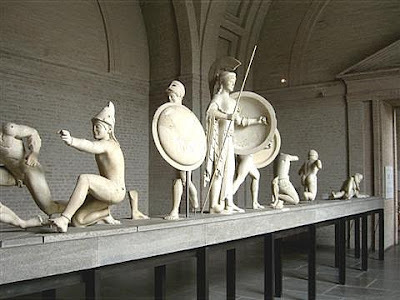 these fragmentary figures of greek and trojan warriors were originally installed in a different configuration which has since been revised. there is an entire room of greek and roman busts installed at various heights, creating the impression of walking through a silent and motionless crowd. it was all extremely satisfying.